What are your methods or how do you store breast milk safely and properly after pumping? If you have confinement nanny, you can ask her for advice as well. Here are 3 main items you should take note of: container, storage method and expiry date of milk. What Types of Container To Use? Store expressed breast milk in capped glass or plastic containers that have been cleaned in a dishwasher or washed in a hot, soapy water and thoroughly rinsed. Consider boiling the containers after washing them if the quality of your water supply is questionable. If the breast milk is only required to store for 3 days or less, plastic bag that is designed for milk storage can be used as well. Economical, plastic bags are not recommended for long term breast milk storage because they may spill, leak and contaminated easily as compared to containers. There are certain components of breast milk that may adhere to the soft plastic bags during long term breast milk storage, which could deprive your baby of essential nutrients. 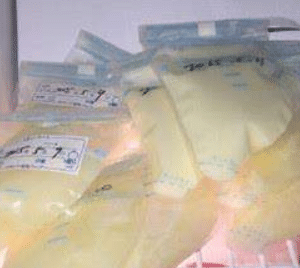 Methods of Storing Breast Milk. Expressed breast milk can be stored in the refrigerator or freezer. The back of the refrigerator or freezer is where you should kept the containers as the temperature there is the coolest. Use your earliest milk first. To minimize waste, fill individual containers with the amount of milk your baby will need for one feeding. You can also consider storing smaller portions – 1 to 2 ounces for unexpected situations or delays in regular feedings. Keep in mind that breast milk expands as it freezes, so do not fill containers to the brim. Be aware that during storage expressed breast milk will separate, causing thick, white cream to rise to the top of the container. Before feeding your baby, gently swirl the contents of the container to ensure that the creamy portion of the milk is evenly distributed. Milk stored at room temperature. Fresh breast milk can be kept at room temperature for six hours. If the milk is not needed that quickly, store it in the refrigerator or freezer. Milk stored in an insulated cooler. Fresh breast milk can be stored in an insulated cooler with ice packs for up to one day. Then use the milk or transfer the containers to the refrigerator or freezer. Milk stored in the refrigerator. Fresh breast milk can be stored in the refrigerator for up to 8 days. Milk stored in the freezer. Breast milk can be stored in a freezer compartment inside the refrigerator for 2 weeks. If the freezer has a separate door and temperature of 0 Celsius, breast milk can be stored for 3 to 6 months. If you have a deep freezer that is opened infrequently, breast milk can be stored for 6 to 12 months. Generally, the sooner you use the milk, the better. Some research suggests that the longer you store breast milk, the greater the loss of vitamin C in the milk, even in refrigerator or freezer. Other studies have shown that refrigeration beyond 2 days may reduce the bacteria killing properties of the breast milk. Long term freezer storage may lower the quality of the breast milk’s lipids.